At the law offices of Goldberg Finnegan, we offer FREE case reviews and only get paid when you win. Have you suffered an injury caused by another motorist? Contact Goldberg Finnegan today to find out how we can help. Doctors, nurses and other medical staff make mistakes. Our lawyers can help explain your legal options. Filing for Social Security Disability benefits can be a confusing and frustrating process. Contact us today for help. At the law offices of Goldberg Finnegan, our legal professionals offer 100% FREE initial consultations and work quickly to obtain the MAXIMUM amount for your personal injury lawsuit. Our goal is restoring peace of mind to you and your family, and getting just reward for the damages you've been made to endure. 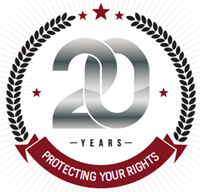 Over the past 20 years, we have recovered tens of millions of dollars for clients in personal injury matters ranging from auto accidents and medical malpractice, to slip and fall and wrongful death. Our established reputation, size, and financial ability allow us to fight the largest defendants against their negligence, whether an insurance company, automobile or product manufacturer, or healthcare system. While our size makes us a formidable opponent, our focus remains on providing personalized client service, prompt attention to all phone calls and emails, and regular case updates.We are proud to represent clients in Maryland, Washington D.C. and Virginia, providing the experience, expertise and passion that you deserve from your injury lawyers. We're here to offer you the legal advice you need, for free. Your case evaluation is free, and there is no obligation to pursue legal action. You won't owe us anything unless we win your personal injury case. Whenever we enter a medical facility, we are trusting our health and our lives to the medical staff and doctors treating us. Doctors and nurses are often overworked and sleep deprived. As a result, medical malpractice is far too common, and medical mistakes are now a leading cause of death and injury across the country. If you believe that you or a loved one has been the victim of medical negligence, contact our medical malpractice lawyers for a free case evaluation. Our attorneys specialize in holding medical professionals and facilities responsible for the injuries that they cause, and we have detailed knowledge of the medical malpractice laws in Maryland, Washington D.C and Virginia. Recovering after an auto accident takes time, as well as the assistance of an experienced legal team. At Goldberg Finnegan, our attorneys work with you and your insurance company to help you get the medical care you need in a cost-effective manner. If you or a loved one was injured in a car, truck, or motorcycle accident, you need experienced legal representation that understands your pain. We will fight for your right to compensation for the negligence that cause you pain, suffering and financial hardship. Our law firm has a reputation for standing up to insurance companies and holding negligent drivers accountable for their actions. If you were injured in an accident, call (888) 213-8140 and have your claim reviewed for free today. Did you know that most applications for Social Security disability benefits are rejected the first time? If your application for Social Security benefits was denied, don't give up! At the law offices of Goldberg Finnegan , our experienced Social Security disability lawyers have detailed knowledge of our nation's Social Security rules and regulations, and providefree consultations to help review the details of your application. Energy drinks are marketed as a quick and easy pick-me-up, but the side effects can be deadly. Children, teenagers, and young adults are especially vulnerable to high doses of caffeine. The high caffeine content in the drinks has been linked to heart arrhythmias, seizures, kidney failure, and sudden deaths. Seemingly healthy adults can also be unexpectedly injured if they suffer from an undiagnosed heart condition. The attorneys at Goldberg Finnegan are helping to lead the fight against these dangerous products. If you have been injured by energy drinks or other highly-caffeinated beverages, Goldberg Finnegan Law can help. Call us today at (888) 213-8140 or use our case evaluation form to learn more about your legal rights. Serious injuries require serious legal representation. If you or your loved one has been injured, get the help you need to recover compensation for your injuries at Goldberg Finnegan. Our attorneys are skilled litigators and negotiators, and will put your best interests first. Whether that means working towards a settlement or taking a case to court, our attorneys will fight for the compensation you deserve. To find out more about how we can help you, call (888) 213-8140 and set up your free appointment today.